OSHA requires employers to provide a workplace that is free from recognized hazards. Influenza (flu) is a hazardous contagious viral respiratory disease that peaks in the winter months. According to the Centers for Disease Control and Prevention (CDC), influenza causes approximately 200,000 hospitalizations and 36,000 deaths in our country each year. Influenza is easily spread from person to person through coughing and sneezing and poor hand hygiene. Healthcare workers are especially at high risk for contracting the flu through exposure to high risk patients. The CDC has classified healthcare workers as a high priority group for yearly vaccinations that are highly effective at preventing influenza. Employers have a duty to create a safe work environment. Therefore, OSHA expects especially healthcare employers to perform a flu risk assessment of the workplace. Because the flu vaccine is highly effective in protection against the influenza virus, OSHA and the CDC encourage healthcare employers to offer the flu vaccine to their employees. There are other precautions besides flu vaccines that employers should take to help prevent the spread of the flu virus. Encourage sick workers to stay home! The CDC recommends that workers who have a fever and respiratory symptoms to stay home until 24 hours after their fever ends without the use of medication. As such, employers should consider flexible leave policies that encourage workers to stay home when they are sick. Employees should be trained on proper hand hygiene and cough etiquette. Employers should post signs on hand hygiene and cough etiquette as visible reminders. For example, everyone should wash their hands after blowing their nose, coughing, sneezing, or coming into contact with mucus or contaminated objects and surfaces. Apply soap and water and rub together for at least 20 seconds. Additional infection control measures include “no touch” wastebaskets for used tissues, disposable towels, air-blower hand dryers, and alcohol-based hand rubs. In healthcare settings, employers should consider guards or reception windows at intake areas, partitions in triage areas, and other barriers between workers and the general public. 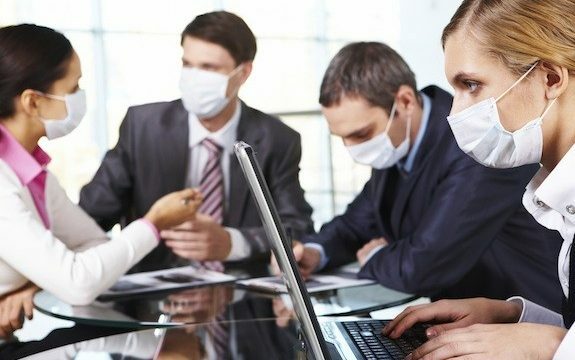 Further, the CDC recommends that healthcare workers use a surgical mask when entering the room of a patient who may have the flu. For further and more detailed information, employers should refer to the Center for Disease Control Guidelines for Preventing the Flu.